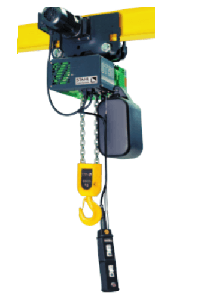 Stahl electric chain hoists are one of our most popular electric hoisting systems here at Lifting Hoists Direct. Built with the highest quality components and innovative designed Stahl electric hoists are a product you can trust to lift your loads safely every time. The ST electric chain hoist is the latest offering from Stahl and it is an exceptional hoisting device and the basis for all set ups. These hoists are powerful and reliable whilst requiring little maintenance, which is straight forward. The Stahl electric hoists are relatively compact and come in safe working loads up to 6300kg. Due to the fact that the complete system of Stahl electric chain hoists is modular, the ST electric hoist can be used in a wide range of lifting applications, standard lifts are the most common lifting practice used with our electric hoists, the ST can be used suspended or base/foot mounted as well as non-standard lifts, short headroom designs, big bag lifting systems and dual hoist systems with the STD & STD vario models. The non-standard set up of the ST hoisting system has come about from regular enquiries about lifting certain troublesome loads, so the popular set ups became part of the range. So take a look at our model range above and you will probably find an electric hoist set up which will suit your lifting operation, whether it is for a standard lift or an awkward lift. If not then please contact us – as we are a highly experienced lifting hoist company we can almost certainly help.